You can find American-style soft cookies at Bakehane, Istanbul. Despite the wonderful and delicious culinary diversity available in Turkey, sometimes as expats we get cravings for the comfort foods and flavors from our homeland or other countries in the world. Luckily, there are a number of expats out there preparing delicious dishes and desserts that cater to expats and can be delivered to your door. Nourish Istanbul is a home food delivery service that offers healthy and delicious international dishes prepared by British expat Chris Davenport and his Turkish wife Oya. Every week, Nourish Istanbul creates a rotating menu based on seasonal ingredients and favored dishes. The menu and photos of each item can be found on the website Nourishistanbul.com and include a weekly menu of varied international savory dishes, such as this week's Burmese jalapeno chicken, Ethiopian berbere stew and buckwheat leek and mushroom risotto to name a few. There is also a rotating weekly "special treat," which can be anything from cinnamon buns to this week's strawberry crumble muffin and homemade granola available for purchase from the website. Orders, which are made through the website, must be filled out by Friday, after which Chris and his wife spend Saturday sourcing ingredients and painstakingly preparing the food. Deliveries are made on Sundays to a wide variety of neighborhoods throughout Istanbul, spanning from Beykoz to Kadıköy and Beyoğlu to Sarıyer. Going into its fifth year, Nourish Istanbul has filled a unique niche for many an expat seeking to add variety to their cuisine and to enjoy healthy, tasty meals at home. I had the opportunity to catch up with Chris, the British cook behind this innovative home delivery service, who tells me "it was just serendipity" that resulted in creating the idea for Nourish Istanbul. "As a bit of a health nut," Chris said, he was already preparing all of his own meals when he saw an advertisement on Craigslist from a local Pilates instructor looking for someone to cater for her and her husband. Chris gave it a try and word quickly got around, he tells me, and so he had more and more requests. "Eventually we decided we should try running it as a proper business, and the rest is history," he said. Licensed to cook out of his own kitchen at home, Chris prepares everything from scratch using only the freshest of ingredients. "I think this is probably our most unique feature, as everything is fresh and the way we cook a meal is just like you'd cook it in your own home," said Chris. "Our menu is decided weekly based on what's in season, and maintaining a good range of options so people can always find something they like. For example, we try and make sure only one dish each week has a chickpea base, and also keep an eye on things like nuts and dairy for those with allergies or dietary restrictions," he added. As for their most popular item, "The cinnamon rolls! I'm not kidding," Chris said, adding that they had so much customer feedback and inquiries about them that they have put this beloved treat on a standard rotation making them available on the first Sunday of each month. Other dishes that are popular include their "chicken zucchini meatballs, black pepper tofu and yellow lentil curry," which Chris said always do particularly well. 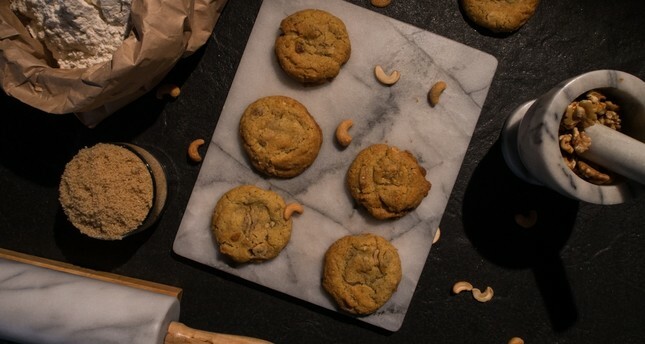 Offering delicious American-style soft cookies for delivery to your door and from the workshop, Bakehane is the brainchild of Sarah Nile Cameron, a half-Turkish, half-American expat of sorts who grew up in Kuwait. After graduating high school, Sarah came to Istanbul and began her professional life singing in a jazz trio and doing vocalist work for television and radio. Although she left to study in Los Angeles, Sarah returned to Istanbul where she began baking from home for cafes and "then eventually decided to take the plunge, make it official and start my own business, which I am still developing to this day." Founded in September of last year by Sarah, in addition to an online ordering and delivery service, Bakehane is now also a workshop, located in Beşiktaş's Arnavutköy neighborhood, in which patrons can order a batch of cookies to be prepared on site or enjoy a classic American, pancake and waffle breakfast, which they have also begun serving in their space, which comfortably accommodates up to two dozen people. Bakehane's menu is divided into two categories, "muzur and uslu," best described as meaning "naughty or nice." On their website, Bakehane.com, there are tempting cookies, such as chocolate chunk, double chocolate, red velvet and ginger snap to name a few as well as healthier gluten-free, paleo, vegan and even raw options of chewy sweet treats all available for order and delivery as well as for purchase on Yemeksepeti.com. Carlos Le Cuistot is the Belgian chef-owner of Le Cuistot Studio in Tarabya. Not only does his cafe serve the finest French and Belgian bread, quiches, pastries and desserts, but Carlos also prepares gourmet meals for dining in-house, take home or catered for your home or business. His gourmet menus include French, Belgian, Italian, Spanish and Moroccan cuisine with beloved dishes such as paella, couscous, tajine, lasagna and boeuf bourguignon, to name a few. Over the past decade, Le Cuistot studio has become a regular stop for the expat community in the know and is extremely popular for its breakfast service and gourmet themed dinners. This Sunday, Le Cuistot Studios will be serving a French and Belgian themed brunch buffet for Easter and will also have a wide variety of holiday treats and Belgian chocolate and sweets available.